Hepatitis C is a silent killer. Most people who have it aren’t even aware they have it, and therefore don’t seek treatment. In fact, you can have it for years and not experience any symptoms, but the next thing you know, you’re deathly ill. Hepatitis C can cause serious damage to your liver, make you very ill, and even kill you…and much of the damage can be done before you even know you have it. Hepatitis C is an infection of the liver that comes from the hepatitis C virus. There are six different variations, or genotypes, and 50 subtypes. The overwhelming majority of hepatitis C infections, however, are type 1 infections. Each variation of hepatitis C is no safer or better than the next, and they all pose similar effects; the main difference is how they respond to treatment. There is currently an estimated 3.2 million cases of hepatitis C in the U.S., but according to the Centers for Disease Control and Prevention (CDC), not nearly that many people are aware they have the condition. That’s the scariest thing about hepatitis C; most of the time, there are no immediate symptoms. For some people, if hepatitis C is detected early enough, it can be a short-term illness. For the majority, however, it is a long-term battle that can lead to serious health problems and even death. By slowly eating away at your liver, this virus can cause liver cancer, liver failure, or liver damage. In fact, hepatitis is the leading cause of cirrhosis, liver cancer, and liver transplants in the U.S.
Cirrhosis is scarring of the liver, which causes it to lose functionality, although it takes a long time (often a decade or more). Cirrhosis is incurable, but hepatitis C is curable. Early detection of hepatitis C is essential to your long-term health and safety. If you have cirrhosis and begin treating hepatitis C, however, it may slow or stop cirrhosis progression. Not everyone who becomes infected with hepatitis C will develop a chronic viral infection, but there is a huge possibility. Approximately 77% to 85% of hepatitis C patients will develop chronic hepatitis C.
As mentioned earlier, it is rather uncommon for symptoms of hepatitis C to be revealed early on. It isn’t until much later, when the liver begins to lose functionality, that it becomes noticeable. Therefore, it is highly recommended you receive a blood test to see if you have hepatitis C before it is too late. The shortest timespan that symptoms can appear after infection is about five to seven weeks. Many of these symptoms can be attributed to a number of conditions; if you’ve currently got a stomach ache, aren’t hungry, or feeling fatigued, it doesn’t necessarily mean you’ve got hepatitis C. However, if you’ve been experiencing these symptoms for an extended period of time, it’s highly recommended you see a doctor as soon as you can, because early detection can mean the difference between life and death. Note: Jaundice is the telltale sign you’ve got a liver problem. If you’ve got a pale or fair complexion and you’ve noticed an unexplainable yellowish tinge to it, see a doctor immediately. The same goes for people who have noticed a yellowing in the whites of their eyes. 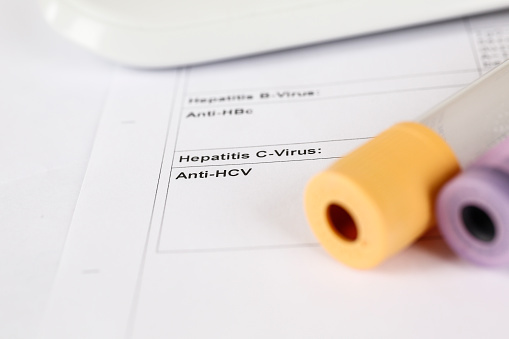 Hepatitis C isn’t particularly easy to contract, but there are definitely some groups who have a higher risk than others. The virus is typically spread from person to person via blood or bodily fluids, but blood is the main culprit. This means intravenous drug users, people who have had blood transfusions, health workers, and people with piercings are at a higher risk than the general population. The virus can also be passed from a mother to child during childbirth. For those of you who are baby boomers, this may be cause for a shakeup. Baby boomers are at a greater risk than others because this generation was most likely to receive infected blood during a transfusion. And although there isn’t what I would call a “good chance” you have it, you are at an elevated risk for the virus. Due to this fact, I strongly advise any baby boomers reading this article to get a blood test, if you haven’t already. Contrary to what you might have heard, you’re not going to contract hepatitis through casual contact, toilet seats, or sharing food or water. You can kiss an infected person and not have to worry about getting the disease; it must get directly into your blood stream. As you might have noticed in the bulleted risk points, nearly all of them involve some sort of direct penetration into the bloodstream via a needle. As far as preventative measures go, the first thing I would do is have your blood examined. Schedule a blood test with your doctor so your plasma can be examined by a specialist. If they find a strain of hepatitis C, you can begin the appropriate treatment. Try not to share personal items that can be exposed to blood, like razors or toothbrushes. It may seem like an innocent thing to do, but the infection can be passed on by directly putting infected blood in contact with your own. Keep these personal items, well, personal. If you’re getting a piercing or tattoo, make sure you do it from a reputable location. Ask the person who’s performing the work to use a clean needle, and watch them take a new, sterilized needle from their collection before they start. The only way to treat hepatitis C is with prescription pharmaceuticals. If you are infected, your doctor will perform an examination and determine the best form of treatment. Treatment will be determined by the genotype and subtype of hepatitis C you have. The sooner you start treatment, the better. If you’re currently undergoing treatment for hepatitis C, you should do your best to avoid alcohol, because it can make liver damage worse. Furthermore, be very careful about taking over-the-counter medicine, prescription medications, and even supplements. Talk to your doctor before taking any medication in order to avoid any kind of adverse reaction. Unfortunately, there isn’t much you can do from a “natural” healing standpoint with hepatitis C. If you haven’t been tested for it, call your doctor. You don’t want to find out before it’s too late. Blahd, W., “What Is Hepatitis C?” WebMD web site; http://www.webmd.com/hepatitis/hepc-guide/digestive-diseases-hepatitis-c?page=2, last accessed August 24, 2015. “Viral Hepatitis – Hepatitis C Information,” Centers for Disease Control and Prevention web site; http://www.cdc.gov/hepatitis/hcv/, last accessed August 24, 2015. “Hepatitis C,” U.S. National Library of Medicine web site; https://www.nlm.nih.gov/medlineplus/ency/article/000284.htm, last accessed August 24, 2015. Roach, K., “Your Good Health: Hep C curable, but cirrhosis irreversible,” Times Colonist web site, August 20, 2015; http://www.timescolonist.com/life/health/your-good-health-hep-c-curable-but-cirrhosis-irreversible-1.2036238.